Three hundred security guards at John F. Kennedy Airport agreed today to walk out on December 20, just the time of year when their absence will be felt most. The non-union employees of two contracting firms, Air Serv and Global Elite, voted to authorize a strike based on complaints about improper training and equipment, along with the fact that they’re paid as little as $8 an hour and often don’t receive benefits like sick days or health insurance. These workers are the ones charged with protecting the tarmac, assuring everyone goes through security, and examining planes for explosives, drugs, and weapons between flights, a task they say they only get a few minutes to complete — and with faulty gear. 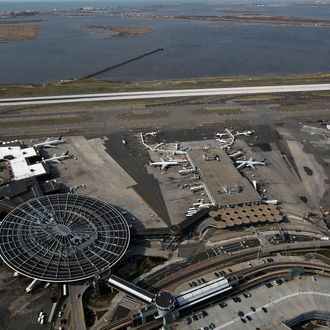 The group has already reached out to the TSA with complaints and is not necessarily looking to unionize, but has been working with the Service Employees International Union 32BJ for support. “They’re trying to get the contractors to improve the situation, and they have not,” a 32BJ rep told the Village Voice. “Instead, they have tried to silent them. They’ve put them into interrogation sessions to find out what they’re up to.” Soon enough, local travelers are going to find out.